Time for my yearly trip to Milan for Design Week! Eurowings, the new-ish budget airline of Lufthansa, FKA Germanwings, turned out to be the cheapest option going to Milan. Much cheaper than Ryanair. So always price shop and never assume Ryanair or EasyJet are the cheapest! By default, the travel agency booked the "BASIC" fare + 1 luggage, even though for just a few more euros, the "SMART" fare includes luggage, seat assignment, and a snack. "BEST" fare is kind of like intra-Europe business class on Lufthansa and other European airlines - same seat as Economy but with middle seat blocked. Now, it was very confusing whether I would be able to earn United miles for this flight. On the mileage earning chart for United, it said only "SMART" fares earn miles, and there was a list of the fare classes. Plus, there were some reports that only SMART and BEST fares were eligible for lounge access with Lufthansa frequent flyer cards. So I thought perhaps it would be best to buy up to a SMART fare. I called Eurowings and asked what my fare class was, and they confirmed it was "PA" class, not one of the classes eligible for earning. I asked what it would take to upgrade to SMART - about 12€ it turns out. But that wouldn't upgrade the underlying fare class! So I resigned myself to not earning miles on the flight, and the possibility of not being eligible for lounge access. With a BASIC fare, there is absolutely no service at all, except for buy-on-board snacks and drinks. As I didn't partake, I don't have anything to report. I did see the flight attendants going around with snack boxes for those traveling on SMART fares. I decided to try my luck in Dusseldorf, and the agent let me in with my United Premier Gold card, without blinking an eye! 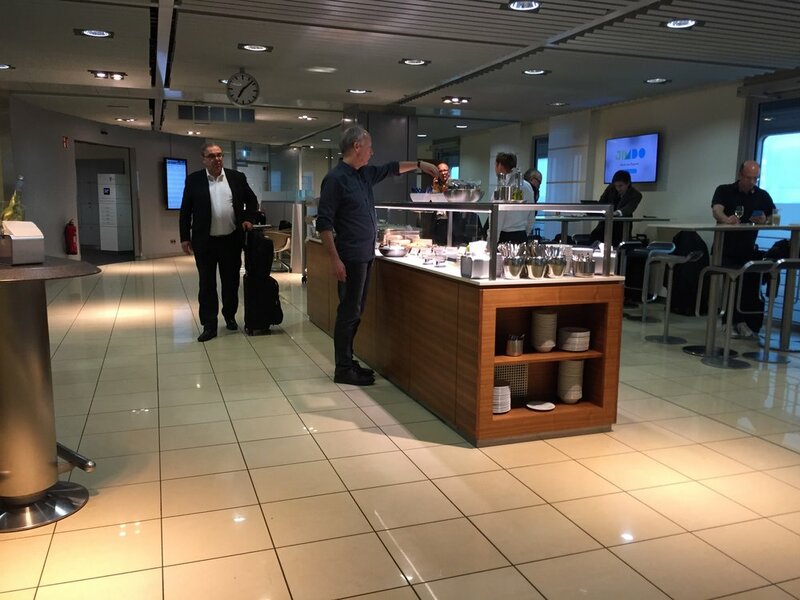 Turns out that United (and ANA) frequent flyers with Star Alliance Gold status still get lounge access on Eurowings BASIC fares, while Lufthansa flyers do not. Time for a nice light evening meal of German pork loaf, with a bit of salad for vegetables ;) And a delicious chocolate pudding. The final pleasant surprise was seeing 100% Premium Qualifying Miles credited to my United account! Turns out the PA\BASIC fare was actually fare class X, and hence was eligible for earning miles, despite United labelling X as a SMART fare and Eurowings calling the fare class PA. So confusing, but a happy ending!